Asclepias purpurascens, (purple milkweed) is blooming albiet sparsely, for the first time ever. Added to our garden three years ago, purple milkweed is one of few asclepias that prefer part sun, although it will also grow in full sun to part shade. If these two little blooms are pollinated and set seed, the seeds will be collected and sent to Native Seed Gardeners, an organization that uses volunteer home gardeners to grow and harvest native plant seeds for restoration of protected conservation landscapes in the Spring Creek Forest Preserves in Chicago's north suburbs. Purple milkweed is primarily pollinated by long-tongued bees, butterflies, and skippers, and Monarch butterflies feed on its foliage. Fortunately, it's rarely bothered by rabbits and deer, thanks to its bitter-tasting, toxic foliage. Although we don't have deer issues in our garden, we do have a lot of bunnies, and they can wreak havoc on vulnerable plants and shrubs here. I found a little piece of the milkweed broken off a few weeks ago. A few lower leaves were removed, and it went into moist potting mix in our cool basement where a few summer vegetables are being started from seeds. The little cutting rooted easily with no special care, and is already growing and sprouting a crop of new leaves. A favorite native in our garden, Spigelia marilandica, or Indian pink, just started blooming this week. Attractive to hummingbirds, Indian pink is easy grow, and prefers well-drained, fertile soil in part sun to part shade. Gail grows this in her garden too, so I think it's safe to say that while it may prefer well-drained soil, it's adaptable and will also grow in clay soil. Ours gets no more than a couple of hours of mostly dappled sunlight, and produces lots of these sweet, unusual yellow and red blooms. Tradescantia ohiensis, commonly known as spiderwort, is native in Illinois. 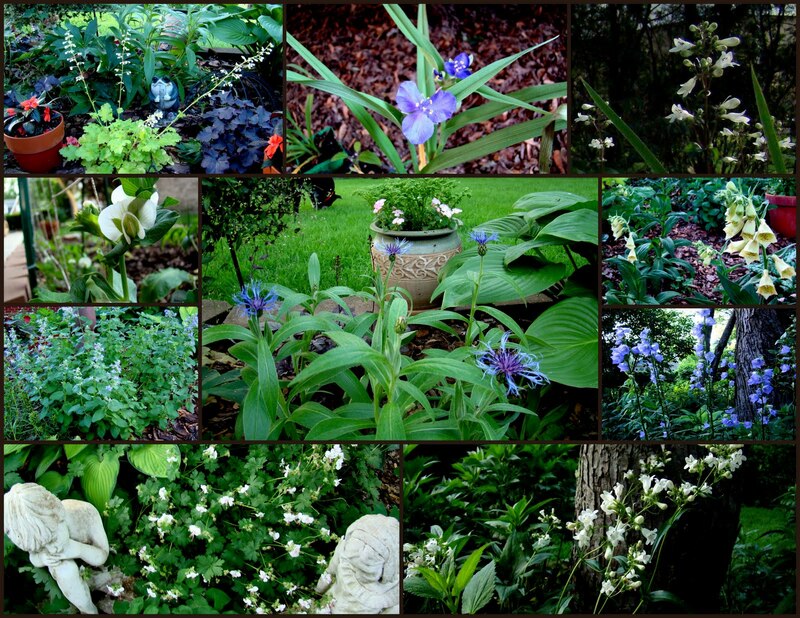 We have a few passalong plants - new additions to our garden this spring. I was on the fence about spiderwort for years, but its sweet blue blooms and the fact that they were free finally won me over. I'm happy to have them in our garden, and hope the bunnies will leave them alone. Spiderwort's leaves and stems are edible for humans too - one of many edible wild plants enjoyed by foragers. If they get too spready here, a few just might end up in a stir fry one day! This is Penstemon digitalis - foxglove beardtongue, also native in Illinois, and blooming for the first time after three years in our garden. The tubular flowers attract honeybees, bumblebees, Anthophorine bees, Miner bees, Mason bees, and large Leaf-Cutting bees. Halictid bees, butterflies, Sphinx moths, and hummingbirds may also visit the very pretty blooms. Growing in a spot that gets about an hour of sun in the morning and two more hours in the afternoon, it was slow getting established. As you can see it's blooming nicely now, although high winds and heavy rains have caused it rather poor posture. Even a bit bendy, it's taller in our garden than 'Huskers Red.' This native penstemon is a welcome addition with its pristine white blooms that show up nicely even at night. Our garden is by no means all native, but the more of them that come to live here, the more I appreciate their quiet beauty and tough constitutions. Adding a few (or a few more!) native plants to an ornamental garden is one of the best ways to attract butterflies and other pollinators to our gardens, and to enjoy nature's beauty in our own backyards. For more Wildflower Wednesday posts, please visit Gail at Clay and Limestone. It's raining today. again! Our swale has rarely been dry this spring, thanks to the torrential rainfalls we've had. We've been lucky having had just a little seepage in the basement, while others in our area have suffered some pretty severe flooding. Thanks to all the rain, the gardens have been very happy. We've also had frequent visitors to the garden, thanks to all the rain. Most notable among the welcome visitors have been Ed and Zelda. We've also had mosquitoes in record numbers, but that's a story for another day. A few weeks ago, Ed arrived without Zelda. When they're here together they take a relaxed swim, then often come out and onto the lawn for a nice rest before heading out again. This time Ed was here alone. He seemed to be looking for Zelda the whole time, and didn't stay as long as usual. I hoped she was ok.
Ah, there she is, and all is right again in Ed's world. Happy Bloom Day from Chicago's south suburbs, where it's 98 degrees one day, 58 the next; and where one can't be sure if there'll be blazing sun and oppressive humidity, or torrential rainfalls and power outages. The weather has kept us on our toes this month. While a little beaten up after over 5 inches of rain last week, the gardens here continue to bloom nicely, even as weeds and tree seedlings sprout in record numbers and grow at record speed. Starting at the top left and going clockwise. here are some of our June blooms: The hellebore 'Mrs. Betty Ranicar' started out white earlier this spring, is still lovely in June, and has aged to a pretty soft green. The Lawn Man wanted to see more annuals blooming, and brought home (among other things,) some white and red New Guinea impatiens - plants we haven't had here for a few years. Last fall's pansies are still hanging around in spite of last week's oppressive heat, and the mini-rose that has outlasted all the others has half-open buds and is fuller and healthier-looking this spring than ever before. Last year's Lacinato kale came back to bloom and set seed which I'll collect for next year's vegetable beds. I fell in love with Tahitian bridal veil (Gibabsis geniculata,) in a hanging basket when I saw it last fall in the Master Gardener office. Although it was labeled as African bridal veil at the nursery, when I wanted to learn more about it, everything I found on the internet calls it Tahitian. Whichever, it's lovely. The blooms close in the early evening, and open again each morning. It's growing and blooming well even with very little sun. Lamium 'Pink Pewter' has settled in well after a few years of underwhelming performance, and has been blooming since April. The hanging basket begonia was another gift from the Lawn Man, who was a bit underwhelmed by the overwintered double impatiens cuttings which grew very slowly during our chillier-than-usual spring. In the center, snow peas, also a bit slow this spring, have the loveliest blooms that would be just as much at home in an ornamental garden as they are in our vegetable bed. They look like little orchids to me. The blooms of Heuchera 'Lime Rickey' are tiny, but I enjoy them all the same. I enjoy their delicacy, and they glow in the waning light of evenings enjoyed relaxing on the patio. I've been a little afraid of spiderwort's spreading ways, but I've always loved them and said yes to a few passalongs. Penstemon 'Huskers Red' has been a stalwart of our June garden since the beginning. It was one of the first plants I added to what was, eight years ago, a barren bed of mulch under three huge silver maples. The yellow foxgloves Digitalis grandiflora have been here almost as long. A few more were started from seed two years ago and they're blooming for the first time this month. The tall blue bellflowers Campanula persicifolia 'Telham Beauty' were passalongs from Mom, taking the place of the ones that broke my heart just a little when they didn't make it the first time I tried them here. Their translucent violet-blue blooms have been favorites in several gardens before this one. They glow just as beautifully in moonlight as they do in midday sun, and our bumblebees visit them from early morning to dusk. Penstemon digitalis is a native plant relatively new to our garden and blooming for the first time this year. It's a little floppy thanks to our torrential rains, but it's pretty all the same, and the pollinators are loving it. It's time to divide Geranium x Cantabrigiense 'Biokovo,' and it's a little worse for wear after the rain, but the bees don't seem to mind a bit. Nepeta x faassenii (catmint) attracts lots of pollinators too, and I like its shorter, less sprawly form better than 'Walkers Low' (a misnomer if you ask me, since it gets about three feet tall. :) Oops there's another pea blossom - guess you can see I really like them! And finally, in the center is Centaurea Montana also known as Mountain bluet, and a favorite of mine for longer than I can remember. There are quite a few other things blooming here in June, but lest this turns into a book as I wax on over this month's blooms, I'll leave it at this for now. Happy Bloom Day all. 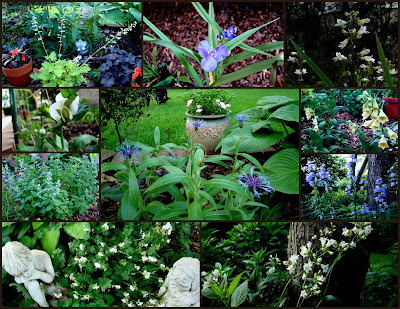 To see more June flowers from gardens all over, please visit Carol at May Dreams Gardens. I took advantage of the opportunity to try a number of new varieties, and in some cases, entirely new-to-me vegetables, including the broccoli raab, and baby pak choi. I have eaten pak choi (also known as bok choy,) but have never grown it until this spring. I grew Renee's F-1 hybrid Baby Pak Choi Green Fortune. Beautiful, tender, sweet, crisp, and delicious, its small size is perfect for a small vegetable garden like mine. Although neither of our two raised beds receives full sun, the pak choi grew very fast, and very well. Before planting, the soil was amended with organic vermicompost from my basement worm bin. (The red wiggler worms are fed only organic kitchen and garden scraps.) No other fertilizers were used or needed. Traditionally used in stir-fry in Asian cuisine, I've yet to try it that way. Green Fortune is so delicious raw in salads, that's how I've been eating it, every day for over two weeks. And no, I haven't gotten tired of it. Besides eating it myself, I have also been using it as the vegetable in George's homemade dog food. He loves it too! He eats it mixed in with his food, and also enjoys it picked straight from the garden, as a treat unadorned. 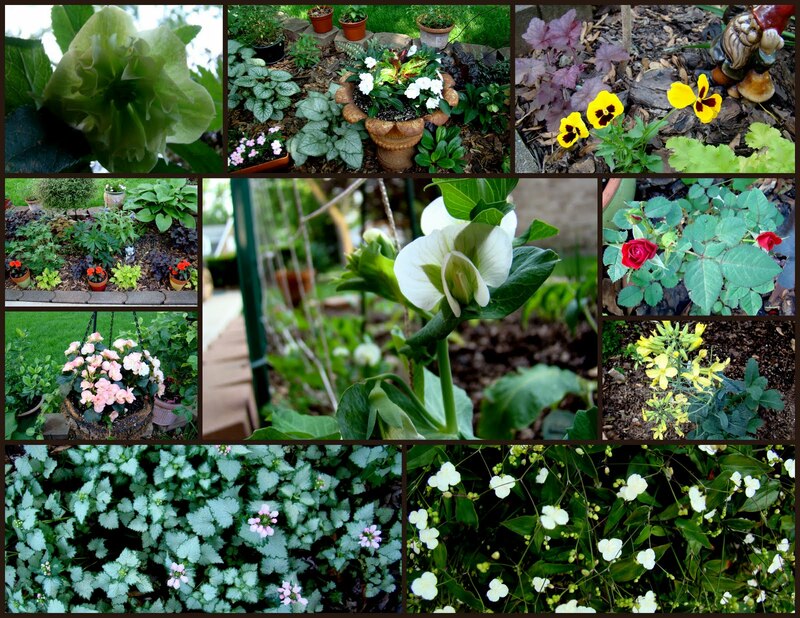 Since it's an early-spring vegetable that matures quickly, I planted a lot of it. After it's all harvested there will still be time to fill in the empty space in the garden with summer vegetables. As you can see in the photo above, I've already done this in one section of the garden, with tomato plants surrounding the remainder of a row of pak choi. Well-planned succession planting is one of the ways we manage to get an incredible amount and variety of vegetables even from our very small beds. Pak choi is very low in calories, yet is one of the most nutrient-dense foods available. A nutritional powerhouse, it's packed with vitamins A, C, K, carotene, lutein, B vitamins, respectable amounts of several minerals including calcium, iron, magnesium, manganese, and zinc, and 28 different polyphenols, including kaempferol, a phytonutrient shown to have strong anti-cancer properties. Renee's Baby Pak Choi Green Fortune has been very easy to grow, not bothered at all by pests, and very productive. I'm so glad I picked it as part of the Media Kit. I will definitely grow this again!